Books & Booze? Well, Who said Book Lovers Can’t Have Fun? This Friday: Support your local library, the heart of our Whitneyville community, and celebrate Spring at the same time. Join friends and neighbors on Friday, April 21st from 6-8 pm at The Playwright Banquet Room, located at 1232 Whitney Avenue. Enjoy complimentary appetizers, a cash bar and readings by Hamden’s own Poet Laureate Franz Douskey. 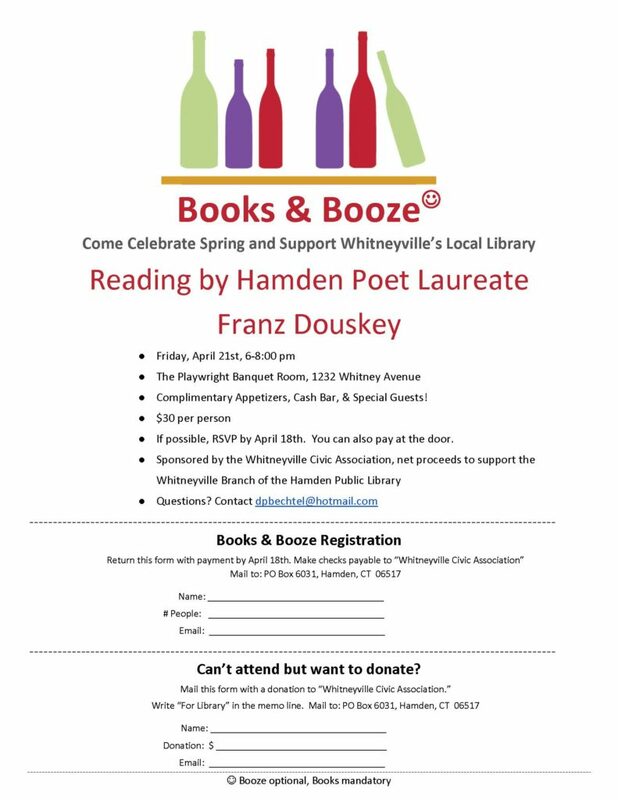 Lightheartedly called “Books & Booze” (with alcohol optional of course), proceeds will be used by the Whitneyville Branch of the Hamden Public Library to support expanded programming and provide additional resources for residents and families in the community. Tickets for this event, sponsored by the Whitneyville Civic Association, are $30 per person with proceeds benefiting our branch of the library. You can RSVP and reserve tickets by emailing Dave Bechtel at dpbechtel@hotmail.com .